When it comes to choosing your primary care physician, you undoubtedly have a lot of questions and specific needs you want to be met. After all, you are trusting your primary care physician with your long-term health and wellbeing. You want someone who is going to be there for you through the good and the bad. You want someone you trust implicitly and who always puts your needs first. Here at Hill Family Medicine & Skin Care, we are passionate about helping local residents throughout the hill country take charge of their health. We are proud to be a primary care physician in Bee Cave. Our clinic borders Austin, which allows us to serve residents from the entire region. If you are looking for a family physician, we invite you to come visit our clinic today. 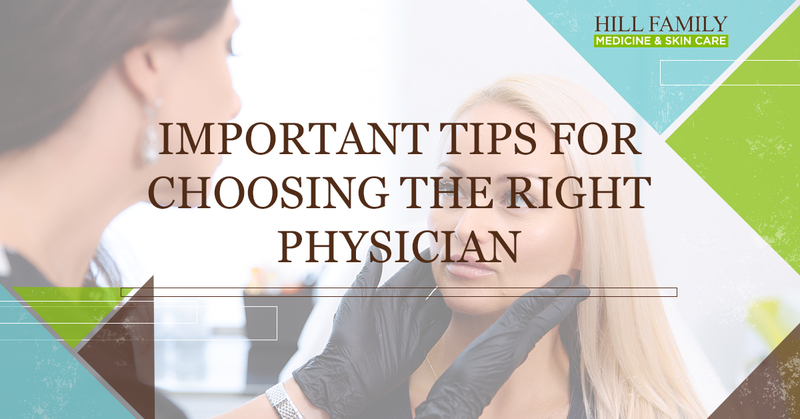 Check out these important tips to keep in mind as you go about choosing your primary care doctor. As you put together a list of physicians in the area, think about their location and proximity to where you live. Here in the hill country, we often have to drive a little way to get to what we need. However, there is a difference between making a quick trip into Bee Cave versus heading to the other side of Austin. Fighting traffic every single time you need to see the doctor is not going to be your ideal. Put together a list of doctors that are located conveniently. Check out their hours as well and make sure that you are near their primary practice. In some cases, a doctor is only visiting an office once or twice a week, which can make scheduling difficult. At a family medical clinic, it is best if the doctors on staff are primarily at one location. If you are going through the work of finding a primary care physician for yourself, you probably also want the doctor to be someone who can treat other members of your family. For example, it is much easier to find one doctor you trust who can also provide basic care for your kids when needed. By choosing a family-focused physician, you know that you will have a doctor who is focused on your entire family’s health. This also means that you only need to build one relationship for your whole family. This doctor will get to know each of you and will have a holistic view of your family’s ongoing health. This makes it much easier to schedule appointments as well. Not all doctors provide the same services. Some physicians specialize in one area, while others offer a more generalized approach. As you go about choosing the right primary care physician for your needs, talk to them about the services they provide. Are they focused on a specific area of practice? Can they provide services that you know are a necessity for your needs? For example, if you have pre-existing skin conditions, you might want to look for a doctor who offers an array of skin care services. Most primary care physicians can handle a good number of routine medical services. If you need someone who is extremely specialized, your primary care physician will usually refer you to a specialist. Once you have narrowed down your selections based upon the above tips, it is time to book an appointment. Schedule an initial consultation so you can get to know a potential doctor face to face. No matter how much information you glean through research, nothing will tell you more about a doctor than a visit to their office. A great way to meet a new physician is to schedule a routine annual exam with them. This will help you get to know their approach to health and will provide you with valuable insights into your current wellbeing. Once you have your appointment scheduled, put together a list of questions you want to ask your doctor. Every person will have different expectations from their primary care physician, so it is vital that you spend some time thinking about your own priorities. What is it that makes a good primary care doctor for you? Don’t be shy and don’t hold back. Use this appointment as a chance to really get to know whether or not the physician is a good fit for your needs. Finally, during your appointment, spend some time thinking about how you are treated by the doctor. Did the physician act rushed or talk over you? Did you feel like they truly heard your concerns? Look for a physician that treats you with respect, values your time, and carefully explains your options. Here at Hill Family Medicine & Skin Care, we are proud to be a trusted primary care physician serving Bee Cave, Austin, Lakeway, and surrounding locations. If you are looking for a family physician that you can trust, we invite you to book an appointment with our doctors today. We would be honored to be your chosen primary care doctor.